The Leopold and Loeb Files takes a first-of-its-kind approach to the infamous murder of 14-year-old Bobby Franks by wealthy University of Chicago students Nathan Leopold and Richard Loeb. Author Nina Barrett has mined the source material generated by the case—court transcripts, psychological reports, recorded interrogations, and more—and arranged them to compose a chilling, fact-driven narrative of the events as they unfolded. 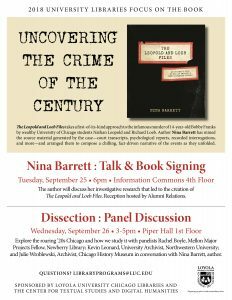 The Loyola Libraries presents two events related to Nina Barrett’s new book. Explore the roaring ’20s Chicago and how we study it with panelists Rachel Boyle, Mellon Major Projects Fellow, Newberry Library; Kevin Leonard, University Archivist, Northwestern University; and Julie Wroblewski, Archivist, Chicago History Museum in conversation with Nina Barrett, author. 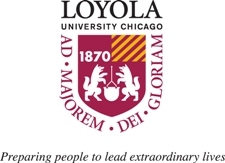 This entry was posted on September 7, 2018 at 1:55 pm and is filed under Events, News, Speaker Series. You can follow any responses to this entry through the RSS 2.0 feed.